Best Hot Tub Steps: Why and What Should We Know About Them? Most people add accessories to enhance their hot tub experience such as hot tub umbrellas, sound systems, etc. Although it’s a great idea to embellish the hot tub to improve the atmosphere, one must always put into consideration some safety measures. Hot tub steps are great safety features since they prevent anyone from falling off when leaving the hot tub. 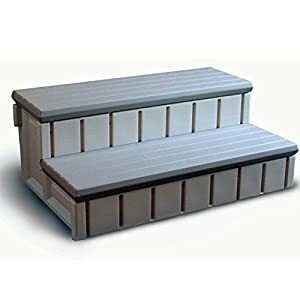 They differ in styles, depending on what suits the buyer such as spa steps with storage, non-skid surfaces, or even hand-rails. Any ordinary hot tub has the potential to become twice as great with the best hot tub steps. 2 What are Hot Tub Steps? This newly redesigned HS2-R hot tub step is highly known to be durable, easy to assemble, and versatile in terms of its use. Its steps could be used with a straight-sided or a rounded hot tub or spa. Its material is made of plastic. The product is sturdy and of good quality. 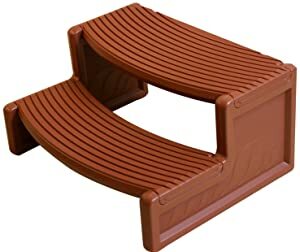 The product is quite cheap in comparison to other hot tub steps. The product is easy to assemble since the steps easily snap together. Although, you need to exert a bit of force to get the pieces to lock. As mentioned, you’ll need a bit of help or exert extra effort when it comes to locking the product’s pieces together. The product is quite squeaky, but it’s understandable considering that it is made of plastic material. The spa step comes with an added feature, which is a compartment that you could use to store spa accessories. The step can support over 300 lbs. and is made up of maintenance-free resin that makes the product more durable and long-lasting. It can also hold in its compartment chemicals, although it does not come with a lock. The product is easy to assemble, especially with tools and prior knowledge at hand. The product contains a storage compartment. The product is sturdy and stable. The product is light and easy to transport. The product has problems with the consistency of its color. The product has problems with the consistency of its design and tooling, specifically its slots and joints. The product takes time and effort to be assembled. This product is a two-tone-all-resin hot tub step which makes it very long-lasting and requires minimum maintenance. The product is very sturdy and easy to assemble. The design doesn’t have many problems in terms of its parts and joints. The product is weather resistant. The exterior aesthetic of the product is easy to match with most hot tubs or spas. The product’s steps could be a bit slippery. Some parts of the product required trimming, and some parts have a poor fitting. The instructions that came with the product are somewhat incomprehensible. It contains a durable resin-design, which makes it reliable for getting in and out of the hot tub. The product is sturdy to use and has good capacity. The product contains an internal compartment. The compartment is relatively large and could be used to store a decent amount of pillows and towels. The product is a bit flimsy. You can’t store chemicals inside the compartments. The product’s surface becomes slippery when wet. The product is entirely made up of plastic and does not require any assembly. It is also weatherproof and UV resistant. 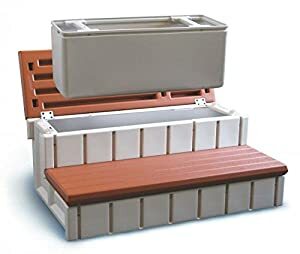 More to that, it also contains a removal storage compartment that doubles as a cooler and is easy to maintain with just soap and water. The product is very sturdy, considering that it’s made up of plastic material. Despite the title, the product does require to be assembled although the steps are quick and easy. The product contains an internal storage, which offers a huge space for items. The internal storage also doubles as a cooler, increasing the product usefulness. The product requires low maintenance care. The water gets in the storage area when it rains hard. Its material is made up of plastic, weatherproof, UV resistant, and is maintained easily by just using soap and water. 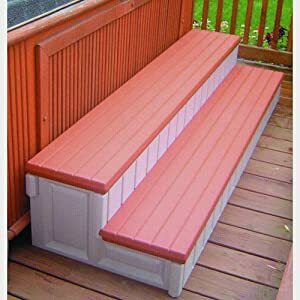 This product is similar to the last one and comes in a redwood or beige color. The storage compartment also doubles as a cooler. It takes time for the product to be assembled. This is designed with durable resin, which is reliable for safe tub entry and exit. The product requires little to zero maintenance. The product takes time to be assembled. What are Hot Tub Steps? Hot Tub Steps are stairs, just like the ones you would find at home, but smaller and specifically designed in order to be perfectly attached or snug up to your spa or hot tub so that a person does not have to exert too much effort just to get in and out of it. They usually come in different shapes and sizes so that they would match whatever hot tub or spa you already have at home. For example, if you have a rounded-shaped hot tub at home, you should look for a round model of hot tub steps in order to match and fit what you have. If you have a hot tub that’s sunk in partially into a deck, you should look for hot tub steps that have fewer steps with their height taken into consideration. It is usually an advantage and wise as a buyer to measure your spa or hot tub in advance in order to find the best step height to ensure your safety and easy entrance or exit. 1. 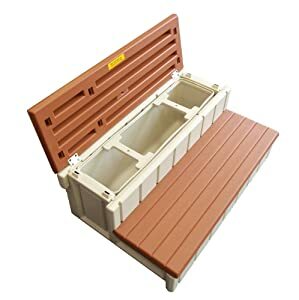 It ensures safety and decreases the chances of accidents from slipping or falling off the hot tub – The primary reason why you should be buying hot tub steps as an added feature for your spa or hot tub is safety. The surfaces that surround the area tend to become wet, which causes it to become more or less slippery. To ensure that no one slips or gets into any wet surface-related accident, it’s wise for the buyer to add hot tub steps to prevent any of the things mentioned from happening. It’s even better if you buy hot tub steps with added features such as handrails or skid-proof surfaces to even further decrease the chances of any accident from occurring. A sturdy handrail is very useful, especially after a lengthy amount of time of getting soaked, which makes it less difficult for anyone to get out of the hot tub and for getting back in it without slipping. 2. It is highly convenient – Hot tub steps provide you with an easier and quicker method of getting in and out of the hot tub. 3. It is durable – Most hot tub steps or spa steps have the capacity to support weight up to 400 lbs. Some hot tub steps are also designed with high-density EP resins, which are resistant to weather, UV rays, and spa chemicals. 4. It is easy to install ­– Most hot tub steps do not require heavy installation. They are usually easy to assemble by simply joining the sides together. 5. Its internal storage provides fast and easy access ­– Hot tub steps with storage could help you store your towels, hot tub blankets, or even hot tub covers. Some also have planter attachments that give your hot tub a much more aesthetically pleasing effect. By going through the seven hot tub steps, we can see that the clear winner is the Leisure Accents Spa Step w/ Storage Compartment. When we look for hot tub steps, we take into account their design, durability, and usefulness. This specific hot tub step is able to meet our criteria. 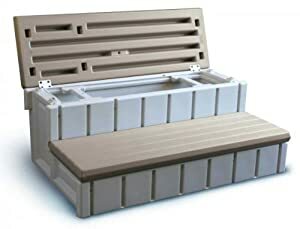 It’s sturdy, durable, offers an added feature which is an internal storage doubling as a cooler, and is quick and easy to assemble. The maintenance of the product is also fairly practical. Although it does have a disadvantage which was mentioned earlier, it still serves its purpose and functions at a high standard.